When scientists presented evidence of an ancient, fossilized brain a few years ago, it challenged the long-held notion that brains don’t fossilize. Now, seven new specimens have been unearthed, each showing traces of neural tissue from what was undoubtedly a brain. A: Under a light microscope, the above fossil shows traces of preserved neural tissues in black. B: An elemental scan of this fossil uncovered that carbon (in pink) and iron (in green) do not overlap in the preserved neural tissue. “It was questioned by many paleontologists, who thought — and in fact some claimed in print — that maybe it was just an artifact or a one-off, implausible fossilization event,” said Strausfeld, a Regents’ professor in UA’s Department of Neuroscience. His latest paper in Current Biology addresses these doubts head-on, with definitive evidence that, indeed, brains do fossilize. In the paper, Strausfeld and his collaborators, including Xiaoya Ma of Yunnan Key Laboratory for Palaeobiology at China’s Yunnan University and Gregory Edgecombe of the Natural History Museum in London, analyze seven newly discovered fossils of the same species to find, in each, traces of what was undoubtedly a brain. The species, Fuxianhuia protensa, is an extinct arthropod that roamed the seafloor about 520 million years ago. It would have looked something like a very simple shrimp. And each of the fossils — from the Chengjiang Shales, fossil-rich sites in Southwest China — revealed F. protensa‘s ancient brain looked a lot like a modern crustacean’s, too. Using scanning electron microscopy, the researchers found that the brains were preserved as flattened carbon films, which, in some fossils, were partially overlaid by tiny iron pyrite crystals. This led the research team to a convincing explanation as to how and why neural tissue fossilizes. In another recent paper in Philosophical Transactions of the Royal Society B, Strausfeld’s experiments uncovered what it likely was about ancient environmental conditions that allowed a brain to fossilize in the first place. The only way to become fossilized is, first, to get rapidly buried. Hungry scavengers can’t eat a carcass if it’s buried, and as long as the water is anoxic enough — that is, lacking in oxygen — a buried creature’s tissues evade consumption by bacteria as well. Strausfeld and his collaborators suspect F. protensa was buried by rapid, underwater mudslides, a scenario they experimentally recreated by burying sandworms and cockroaches in mud. This is only step one. Step two, explained Strausfeld, is where most brains would fail: Withstanding the pressure from being rapidly buried under thick, heavy mud. To have been able to do this, the F. protensa nervous system must have been remarkably dense. In fact, tissues of nervous systems, including brains, are densest in living arthropods. As a small, tightly packed cellular network of fats and proteins, the brain and central nervous system could pass step two, just as did the sandworm and cockroach brains in Strausfeld’s lab. Now that he and his collaborators have produced unassailable evidence that fossilized arthropod brains are more than just a one-off phenomenon, Strausfeld is working to elucidate the origin and evolution of brains over half a billion years in the past. “People, especially scientists, make assumptions. The fun thing about science, actually, is to demolish them,” said Strausfeld. The above post is reprinted from materials provided by University of Arizona. Note: Materials may be edited for content and length. University of Arizona. “Ancient brains turn paleontology on its head: Strongest evidence yet that it’s possible for brains to fossilize and, in fact, a set of 520-million-year-old arthropod brains have done just that.” ScienceDaily. ScienceDaily, 9 November 2015. <www.sciencedaily.com/releases/2015/11/151109083905.htm>. Tre extinct creature is believed to have roamed the Earth between 10,000 and 15,000 years ago. When farmer James Bristle and his neighbor discovered a “wood-like” object while digging in his Michigan soybean field on Monday, the duo thought they had uncovered something fairly mundane. But upon closer inspection of the object, it started looking more and more like bone, said the farmer. Paleontologists confirmed this week that the discovery, in Washtenaw County’s Lima Township, was indeed “out of the norm.” The “fence post” Bristle found turned out to be a part of a skeleton of a woolly mammoth that roamed the Earth between 10,000 and 15,000 years ago. 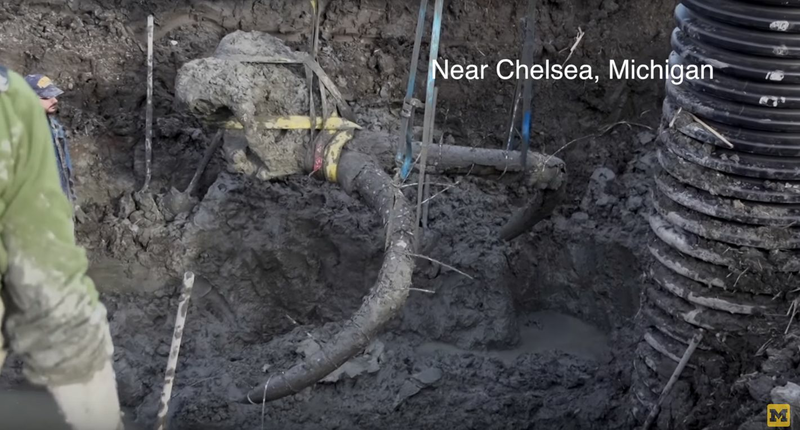 University of Michigan Professor Dan Fisher has been leading the dig to remove the mammoth’s remains from Bristle’s property this week. He told Ann Arbor News that the mammoth was probably 40 years old when it died, and had been hunted by humans who likely butchered it and stashed it in a pond. Woolly mammoths, rhinos and other ice age beasts may have munched on high-protein wildflowers called forbs, new research suggests. And far from living in a monotonous grassland, the mega-beasts inhabited a colorful Arctic landscape filled with flowering plants and diverse vegetation, the study researchers found. The ancient ecosystem was detailed today (Feb. 5) in the journal Nature. To understand the ancient landscape better, researchers analyzed the plant genetic material found in 242 samples of permafrost from across Siberia, Northern Europe and Alaska that dated as far back as 50,000 years ago. According to paleontologists from the University of Chicago and the University of Michigan, long-extinct Bandringa sharks migrated downstream from freshwater swamps to the ocean to spawn in shallow coastal waters and left behind fossil evidence of one of the earliest known shark nurseries. This is an artist’s impression of Bandringa shark. 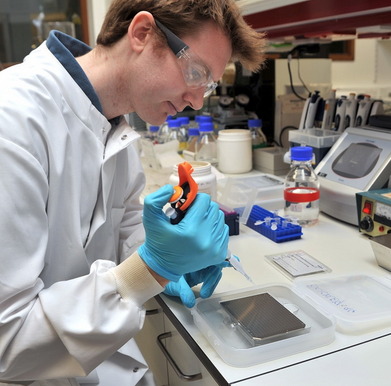 Image credit: John Megahan / University of Michigan. The long-snouted Bandringa shark (Elasmobranchii, Chondrichthyes) – a bottom-feeding predator that lived in an ancient river delta system in what is today the Upper Midwest – is likely one of the earliest close relatives of modern sharks. It resembled present-day sawfish and paddlefish, with a spoon-billed snout up to half its body length. Juveniles were 4 to 6 inches long and grew into adults of up to 10 feet. Bandringa sharks were discovered in 1969 and soon became one of the most prized fossils from the well-known Mazon Creek deposits in northern Illinois. Until now, paleontologists believed that the genus Bandringa contained two species – B. rayi and B. herdinae, one that lived in freshwater swamps and rivers and another that lived in the shallow ocean. Scientists discover an ancient shark nursery in … Illinois? An Australian-U.S. team of paleontologists has found a unique fossil of a huge, carnivorous platypus that lived in what is now Australia during the late Miocene. This is an artist’s reconstruction of Obdurodon tharalkooschild. The inset shows its first lower molar. Image credit: Peter Schouten. The modern platypus is a duck-billed, venomous, semi-aquatic mammal with webbed feet and is covered in short waterproof fur. It is one of the five extant species of monotremes, the only mammals that lay eggs instead of giving birth. The new extinct species of platypus, named Obdurodon tharalkooschild, has been described from a unique tooth fossil found at the famous Riversleigh World Heritage Area of Queensland. The specific name, tharalkooschild, honors an Indigenous Australian creation story about the origin of the platypus. Unlike the living species, Obdurodon tharalkooschild had fully functional teeth that may have been used to kill and consume a wide range of animals that lived alongside it in ancient pools and lakes. Based on the size of its tooth, it is estimated that Obdurodon tharalkooschild would have been twice the size of the modern platypus, around 3.3 feet (1 m) long. “Like other platypuses, it was probably a mostly aquatic mammal, and would have lived in and around the freshwater pools in the forests that covered the Riversleigh area millions of years ago,” explained Prof Suzanne Hand from the University of New South Wales, a co-author of the article published in the Journal of Vertebrate Palaeontology. 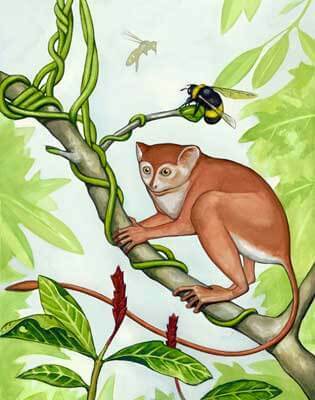 An artist’s conception of what the newly discovered primate, Archicebus achilles, might have looked like. An international team of paleontologists that includes Northern Illinois University anthropologist Dan Gebo is announcing the discovery of a nearly complete, articulated skeleton of a new tiny, tree-dwelling primate dating back 55 million years. The Eocene Epoch fossil was recovered from Hubei Province in central China. “This is the oldest primate skeleton of this quality and completeness ever discovered and one of the most primitive primate fossils ever documented,” Gebo said. “The origin of primates sets the first milestone for all primate lineages, including that of humanity. The research team, led by Xijun Ni of the Institute of Vertebrate Paleontology and Paleoanthropology (IVPP) at the Chinese Academy of Sciences in Beijing, describes the fossil in the June 6 edition of the prestigious science journal, Nature. Other authors on the article include Marian Dagosto of the Feinberg School of Medicine at Northwestern University in Chicago; K. Christopher Beard of the Carnegie Museum of Natural History in Pittsburgh; Paul Tafforeau of the European Synchrotron Radiation Facility in Grenoble, France; and Jin Meng and John Flynn of the American Museum of Natural History in New York. This fossil primate was encased within a rock and discovered after the rock was split open, yielding a skeleton and impressions of primate bones on each side of the two rock halves. One half is shown here. Ni said that while doing fieldwork years ago in Hubei Province, he first came across the fossil, which had been found by a local farmer and was later donated to the IVPP. The fossil was encased within a rock and discovered after the rock was split open, yielding fossils and impressions of the primate on each side of the two halves. It was discovered in a quarry that had once been a lake and is known for producing ancient fish and bird fossils from the Eocene Epoch. The quarry is near Jingzhou City, south of the Yangtze River, and about 270 kilometers southwest of Wuhan City, the province capital. The fossil has been named, Archicebus achilles. Of all species that have existed on Earth, 99.9 percent are now extinct. Many of them perished in five cataclysmic events. Could the sixth be upon us ? Ordovician-Silurian, Late Devonian, Permo-Triassic, Triassic-Jurassic and Cretaceous-Paleogene. Of all species that have existed on Earth, 99.9 percent are now extinct. Many of them perished in five cataclysmic events. 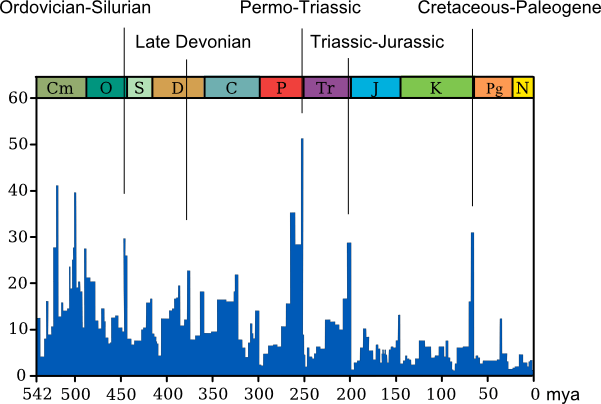 The classical “Big Five” mass extinctions identified by Raup and Sepkoski are widely agreed upon as some of the most significant: End Ordovician, Late Devonian, End Permian, End Triassic, and End Cretaceous. According to a recent poll, seven out of ten biologists think we are currently in the throes of a sixth mass extinction. Some say it could wipe out as many as 90 percent of all species living today. Other scientists dispute such dire projections. “If you look at the fossil record, it is just littered with dead bodies from past catastrophes,” observes University of Washington paleontologist Peter Ward. Ward says that only one extinction in Earth’s past was caused by an asteroid impact – the event 65 million years ago that ended the age of the dinosaurs. All the rest, he claims, were caused by global warming. Ward’s study, Under a Green Sky, explores extinctions in Earth’s past and predicts extinctions to come in the future. Ward demonstrates that the ancient past is not just of academic concern. Everyone has heard about how an asteroid did in the dinosaurs, and NASA and other agencies now track Near Earth objects. Unfortunately, we may not be protecting ourselves against the likeliest cause of our species’ demise. Ward explains how those extinctions happened, and then applies those chilling lessons to the modern day: expect drought, superstorms, poison–belching oceans, mass extinction of much life, and sickly green skies. The significant points Ward stresses are geologically rapid climate change has been the underlying cause of most great “extinction” events. Those events have been, observed Harvard evolutionary biologist Stephen Gould, major drivers of evolution. Drastic climate change has not always been gradual; there is solid empirical evidence of catastrophic warming events taking place in centuries, perhaps even decades. The impact of atmospheric warming is most potent in its modification of ocean chemistry and of circulating currents; warming inevitably leads to non-mixing anoxic dead seas. We are already in the middle, not the beginning, of an anthropogenic global warming, caused by agriculture and deforestation, which began some 10,000 years ago but which is now accelerating exponentially; though the earliest wave of anthropogenic warming has been stabilizing and beneficial to human development, it appears to have the potential for catastrophic effects within a lifetime or two. An analysis of the geological record of the Earth’s sea level, carried out by scientists at Princeton and Harvard universities supports Ward using a novel statistical approach that reveals the planet’s polar ice sheets are vulnerable to large-scale melting even under moderate global warming scenarios. Such melting would lead to a large and relatively rapid rise in global sea level. According to the analysis, an additional 2 degrees of global warming could commit the planet to 6 to 9 meters (20 to 30 feet) of long-term sea level rise. This rise would inundate low-lying coastal areas where hundreds of millions of people now reside. It would permanently submerge New Orleans and other parts of southern Louisiana, much of southern Florida and other parts of the U.S. East Coast, much of Bangladesh, and most of the Netherlands, unless unprecedented and expensive coastal protection were undertaken. And while the researchers’ findings indicate that such a rise would likely take centuries to complete, if emissions of greenhouse gases are not abated, the planet could be committed during this century to a level of warming sufficient to trigger this outcome. Canadian research team, helped by scientists at The University of Manchester, discovered the first evidence of an extinct giant camel in the High Arctic. The 3,5 million year old fossil was identified using new collagen fingerprinting from bone fragments unearthed on Canada’s High Arctic Ellesmere Island. It’s the furthest North a camel has ever been found. The fossils were collected during summers of 2006, 2008 and 2010 by Dr. Natalia Rybczynski, a vertebrate paleontologist with the Canadian Museum of Nature. 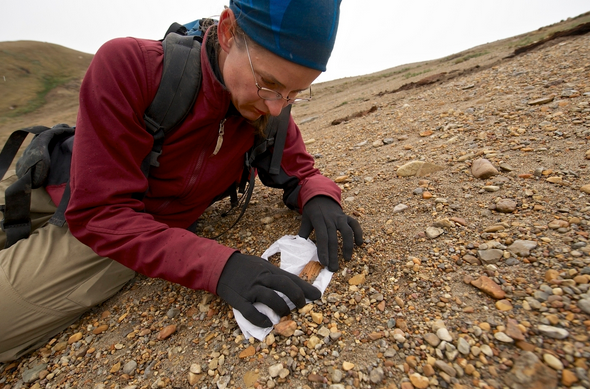 Dr. Natalia Rybczynski collects a fossil bone at the Fyles Leaf Bed site on Ellesmere Island in 2008. The fossil in situ looks very similar to wood. She uses toilet paper to wrap the fossil for transport to the base camp. CREDIT: Martin Lipman, Canadian Museum of Nature. The camel bone fragments were collected from a steep slope at the Fyles Leaf Bed site, a sandy deposit near Strathcona Fiord on Ellesmere Island. Other fossil finds at the site suggest the High Arctic camel was living in a boreal-type of forest environment, during a global warm phase on the planet. Dr Buckley carrying out the process of collagen fingerprinting to determine which species the bone fragments belong to. At first, it was unclear which species the bones they found came from so they asked the help of Dr. Mike Buckley from Manchester Institute of Biotechnology. He used the pioneering technique called “collagen fingerprinting” to identify the animal. Dr. Buckley compared the profile he found with the 37 mondern mammal species as well as that of a fossil camel found in Yukon. He found that the collagen profile for the High Arctic camel was almost an identical match to the modern day Dromedary as well as the Ice-Age Yukon giant camel. The collagen information, combined with the anatomical data, demonstrated that the bone fragments belonged to a giant camel as the bone is roughly 30% larger than the same bone in a living camel species. The specimen found are spectacular, said Dr. Roy Wogelius from The University of Manchester’s School of Earth, Atmospheric & Environmental Sciences after he analysed the mineral content of the bones. His findings suggest that mineralization worked along with cold temperatures to help preserve the proteins in the bones. “This specimen is spectacular, and provides important clues about how such exceptional preservation may occur”, he said. An ancient hominin jawbone unearthed in a Serbian cave may be more than half a million years old. 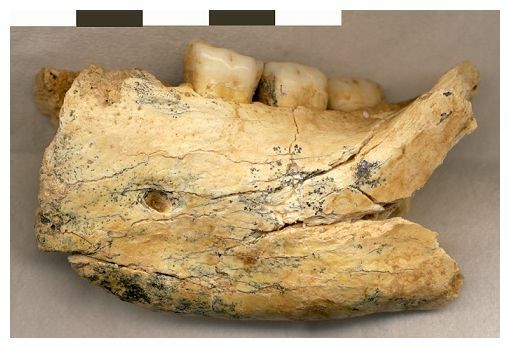 Scientists have unearthed a jawbone from an ancient human ancestor in a cave in Serbia. The jawbone, which may have come from an ancient Homo erectus or a primitive-looking Neanderthal precursor, is more than 397,000 years old, and possibly more than 525,000 years old. The fossil, described today (Feb. 6) in the journal PLOS ONE, is the oldest hominin fossil found in this region of Europe, and may change the view that Neanderthals, our closest extinct human relatives, evolved throughout Europe around that time. 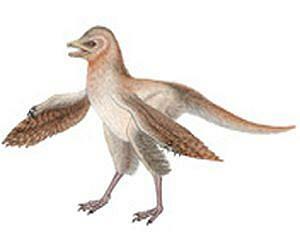 The discovery of a new bird-like dinosaur from the Jurassic period challenges widely accepted theories on the origin of flight. Eosinopteryx. Credit: Royal Belgian Institute of Natural Sciences. 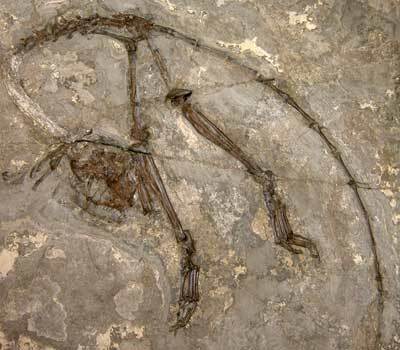 Co-authored by Dr Gareth Dyke, Senior Lecturer in Vertebrate Palaeontology at the University of Southampton, the paper describes a new feathered dinosaur about 30 cm in length which pre-dates bird-like dinosaurs that birds were long thought to have evolved from. Over many years, it has become accepted among palaeontologists that birds evolved from a group of dinosaurs called theropods from the Early Cretaceous period of Earth’s history, around 120-130 million years ago. Recent discoveries of feathered dinosaurs from the older Middle-Late Jurassic period have reinforced this theory. The new ‘bird-dinosaur’ Eosinopteryx described in Nature Communications this week provides additional evidence to this effect.